With award season in full motion, you don't want to miss an issue of The A-List, the real deal on Hollywood....welcome to Issue# 52! ONE NIGHT ONLY...It was history in the making. No, not the Hillary Clinton White House run ('cause Black congresswoman Shirley Chisholm was actually the first woman to run for Prez). We're talking about the Oscar nominations. 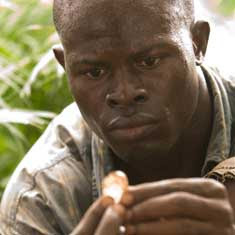 Hollywood has been buzzing all week about the fact that for the first time-ever, five black actors have been nominated--Forest Whitaker (which The A-List predicted in Issue #40, http://thealistmagzine.blogspot.com/2006/10/40-forest-whitaker.htmlr.html) and Will Smith for Best Actor; Eddie Murphy and Djimon Hounsou (pictured) for Best Supporting Actor; and Jennifer Hudson for Best Supporting Actress. But what was a bit disappointing is Dreamgirls (which got 8 nods) didn't make it to the best pic category. With the speed that was picked up by musicals Chicago and Moulin Rouge, we hoped it would have extended to Dreamgirls. The debate will probably go on for quite a bit, but still kudos for these actors. Also congrats to those behind the scenes (like Dreamgirls PR whiz Ava DuVernay (The DuVernay Agency) and James Lassiter (Smith's Overbrook Entertainment partner and dealmaker)--and the Academy for recognizing diverse talent. Although the acceptance speeches may not be as colorful as that of Three 6 Mafia last year, trust that we will look forward to hearing them all! SETTING THE STAGE FOR SAG...Of course the SAG Awards are airing this Sunday (Jan. 28th), and you'll be able to view it on two networks. The show will be a TNT and TBS special simulcast. Two randomly selected panels each comprised of 2,100 SAG members picked just who will take home awards. Shout out to TBS and TNT for such fine press materials but we hope network PR camps are considering just using digital packages rather than reams of paper particularly when the info is abundant. Look for our feedback next issue on all the winners, snubs and backstage drama. WEB WORRIES, ACT NOW...Take a moment and go to www.savetheinternet.com to stop corporate America from trying to create two levels of Internet--one faster and more expensive for big business and the other smaller and slower those unable to pay the ISP. This move will out price many African Americans and others. It's also not a great deal for businesses that just don't want to pay extra. Once you sign in at http://www2.blogger.com/savetheinternet.com, the site will automatically send the message to your political representative. Keep the Internet within reach of common people! HOLD THE PHONE...With the recent announcement that mobile phone sales during 2006 reached over one billion, look for mobile phone films and overall mobile video content to rise in parallel manners. Given the ubiquity of the devices, the expansion international distribution opportunities is a welcome sight for filmmakers. In fact, nations in emerging market areas of Asia, Central and Eastern Europe, the Middle East, Africa and Latin America actually accounted for a higher portion of mobile phone purchases last year than North America, Japan and Western Europe. If those handsets are mostly video enabled, it would be interesting to see how cell phone owners downloaded content. Imagine the potential. SISTER ACT...She's at it again. Jamie Foster Brown is making more moves. The founder of the urban celebrity magazine Sister2Sister magazine has just ventured into radio with PopNetworks. The black gossip diva's “What’s Up With Jamie Foster Brown” is a nationwide celebrity driven radio show boasting 46 U.S. cities via Westwood One and internationally via the BBC. Having launched Jan. 21, the show pulled in a million-plus listeners its first time out. Although not using shock tactics of the ever popular radio jock Wendy Williams, Brown seems to be finding a niche with her own style. We can see urban entertainment company PopNetworks eying even other possibilities, such as taking the show to the small screen. DIGITAL DON...BET alert. The folks over at the reigning black network have announced its finance chief, Scott Mills, has been promoted to head the new digital media business unit. This will be a move to watch. His credits include spearheading the creation of BET Mobile; the launch of BET's digital video download offering on iTunes; and the expansion of BET's VOD product; so we wonder why he is not being placed in this position full time to really build out BET's Digitals' offerings. Double-duty is tough and actually we see no other model like this on at any other network. Maybe he's easing someone else into the CFO slot. If so, there'll be more BET employment announcement s to come. We'll let you know. MORE THAN MEETS THE EYE...We like cute celebrity couples just like everyone else. But we'd love to see Tracey Edmonds referred to in the press as president/COO of Our Stories Films, rather than solely Eddie Murphy's new main squeeze. We'd also love to hear what's going on with the Bob Johnson-Weinstein Co. venture (see The A-List Issue #34, http://thealistmagzine.blogspot.com/2006/09/34-bmi-urban-music-awards.htmltmagzine.blogspot.com/2006/09/34-bmi-urban-music-awards.html) and what Tracey's latest moves are and plans for 2007 releases. C'mon now. With few Black women in such positions we vote for less time in front of the camera and more in time in what is going on behind the camera for this venture. Announcements, anyone? ANSWERING THE CALL...Thumbplay, an online retailer of mobile entertainment content, announced the week's top ring tones (Jan. 23), and once again it is dominated by urban music. "We Fly High" by rapper Jim Jones, "Fergalicious" from Fergie, "I Wanna Love You" from African hip-hop artist Akon, "Stuntin' Like My Daddy" by Birdman & Lil Wayne were the top four, followed by dance metal group Unk and Gwen Stefani. "Irreplaceable" by Beyonce came in 7th place, followed by another Akon tune, "Smack That." Although the industry is in a panic about the dropping sales of R&B and hip hop, these artists have turned, obviously, to another money-making medium. The question is: When will we see more direct deals with carriers and the like for Blacks companies entering this realm. Having reaped the benefits of the creativity of young Black recording artists, it would seem now is a the time for some balanced dealmaking from the carriers, right? CALL FOR ENTRIES...The Atlanta HipHop Film Festival (AHFF) is returning and is looking for a few good films/videos. AHFF (Aug. 24-26, Georgia International Convention Center) is accepting submissions on projects that celebrate Hip Hop. Founder Shameka Gumbs tells us that in 2005, the festival’s inaugural year, 45 films were screened and several landed distribution deals through Warner Brothers, HBO, and Maverick Platinum Entertainment Group. Early Deadline-Feb. 9; Late Deadline-postmarked by March 9. For info, hit www.AtlHipHopFilmFest.com or call 877- ATL-HHFF. BREAKING DOWN THE BARRIERS...Talk about getting your foot in the door by any means necessary. Elle Empire Entertainment (http://www.elleempire.com/), a multi-cultural team of female producers, used the side door of technology to get to TV. After months of trying to get the attention of cable and major networks for their ten, "real life" productions, Jordan Anderson, Jelani Bandele and Cielito Pascual took it to the people. In Nov. 2006, their mini-documentary, Crazed: The Bellydance (http://www.current.tv/watch/17137320), featuring female and male, veteran, traditional and tribal belly dancers was featured online at Current TV. In less than two weeks the piece received more than 6,000 views and rave reviews, and was greenlit to air on the Current TV network where it can now be seen daily nationwide. "Our goal is to create must-see content that really is real and reflects what the people, not just celebrities, are doing on a daily basis," says Bandele. Now, Current TV has commissioned Elle Empire Entertainment to produce two additional films for the network, which are now in pre-production. The films, tentatively titled Hug Me Now and No I Do, highlight the cuddle party craze and committed couples determined not to marry. Future filmmakers take note: Use any outlet available...you don't always have to hit Hollywood first. APPRENTICE NEEDED...She may have parted ways with Donald Trump, but his former TV sidekick Carolyn Kepcher is looking for an apprentice of her own. She's launched a company--Carolyn & Co.--and is set to announce a Website focused on women who are just out of college, seeking to advance their careers or those trying to strike a successful balance between career and family. She's also is writing a new column exploring similar issues for one of New York's large daily papers. While her apprentice won't be on air--at least just yet--it sounds like an opportunity to get in the ground floor of a new venture. Interested candidates, email carolyn@carolynkepcher.com. SAPPHIRE SHOOTS FOR SUCCESS...The first African American-owned film and television studio and distribution company is ready for its first theatrical releases. According to Sapphire Entertainment (http://www.sapphireent.com/) CEO, Andrea Allen, the company is beginning production on several original feature films. One of the first scheduled for principal photography in June is action-thriller Lethal Injection, centering around government AIDS experiments. It will be released worldwide on Nov. 30, in honor of World AIDS Day with some proceeds donated to HIV awareness and prevention. Also on the roster is the urban drama Black Bird, and the romance Unlucky-In-Love. Sapphire is hitting all the genre bases, but they're going to need some star power--and major production money--to pull these off. Here's hoping. HOLY TOUCHDOWN...How would have thought gospel and super bowl go together? Well, the 2007 Super Bowl Gospel Celebration (http://www.superbowlgospelcelebration.com/) is actually in its eighth year. Hosted by actor/comedian Cedric The Entertainer and executive produced by Kyle Bowser, the Miami event will feature gospel acts Yolanda Adams, Fred Hammond, Hezekiah Walker. Look for more than a few athletes to be in the house as well and for the event to wind up on the tube. ABRACADABRA...The annual All-Star Week charity event Hoop Magic, sponsored by TV One, Southwest Airlines, Coors, Castries Crème and Comcast, takes place Feb. 16-18 and will support the Dr. Sheila C. Johnson Foundation. The foundation strives to raise awareness of issues impacting the Hip Hop community including childhood obesity, financial empowerment, teen violence, and education. Johnson is co-founder of BET and the first African-American female WNBA managing partner. Happening at the Red Rock Hotel, this year’s events include A Tribute to Donnie Simpson, BET’s first VJ; and Celebrity Sports Talk Show hosted by ex-B-baller John Salley. All events will air on both TVOne and Comcast. Such happenings always make for ready made TV programming and should be an advertising coup for networks. BLACK FILM ROAD SHOW...The African Film Festival (http://www.africanfilmny.org/) has hit the road for the 11th annual AFF National Traveling Series. The program travels to cultural institutions, museums, and universities in cities in the U.S. and Puerto Rico. The series started Jan. 20th in Baltimore and will wrap up May 28 in Brooklyn. Say, if you can't get to the festival...let the festival come to you. It's a smart move to not only give viewing opportunities for audiences who would otherwise not have access to viewing films from the Continent and its Diaspora but to also promote the festival and the filmmakers. JAZZ MAN COMETH ...It's been called “one of the most starkly beautiful and moving documentaries ever made about a jazz musician.” Look for My Name is Albert Tayler (www.mynameisalbertayler.com/), directed by Kasper Collin, to open worldwide Feb. 9th. 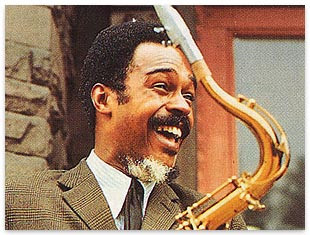 The Swedish film focuses on 34-year-old jazz innovator, saxophonist Albert Ayler who was found dead in 1970 in New York's East River. There's already buzz about it for next year's Oscars. See for yourself and remember The A-List told you first. CELLULOID CELEBRATION...If you're in Kansas City, Missouri, you will want to check out "A Celebration of Black Film," presented by Phillips-West Public Relations & Communications and the University of Missouri-Kansas City. There will be screenings and discussions with the likes of Jawn Murray, national entertainment columnist and reporter; Mara Brock Akil, creator and executive producer of the CW sitcom "Girlfriends;" and former swim coach Jim Ellis, inspirational subject of the movie Pride (which stars Terrence Howard). And there will be the premiere of the documentary The Best Black Films (Ever), written and directed by Fox 4 News Film Critic Shawn Edwards. For info, call 816-241-1111. TOON TIME...Trust us to always have our ear to the ground first. We recently stumbled upon a gem named Black Superheroes (www.mamasboyz.com/cartoons/blacksuperheroes.html), a web cartoon created by Jerry Craft, the man behind "Mama's Boyz." Look for Craft's latest to hit the tube soon. Another A-List scoop. The Wii News Channel has just launched. It will let gamers keep up to date on current events in an interactive way. The new channel was originally planned to be available alongside the console's launch in November, but Nintendo pushed back the release of the news channel. With the Wii news channel, like every other feature with the console, user have a new way of navigating through and managing the available content. The channel contains stories from worldwide through and exclusive contract with the Associated Press. Users can sort through the content to show national, international, sports, arts/entertainment, business, science/health, and technology news under various categories. After choosing a category, all of AP's stories for the past 24 hours are shown. Select a story and about 3/4 of the screen features a virtual newspaper of the entire story, including any corresponding pictures. But that's not all; the other 1/4 features a virtual globe, zoomed in to the location of the story. With the globe, users can also pull up stories by regions worldwide. Recently FCC Commissioner, Michael Copps, declared that the state of black media ownership was, well deplorable. While many in the industry--and even consumers--already knew this to be the case, it marked a major turn for this Administration to admit so. But what does this actually mean for Black entrepreneurs and execs in the industry? In case you missed it, here's what Copps said during his speech at a forum held at the 10th annual Wall Street Project conference of Rainbow/PUSH, helmed by Rev. Jesse Jackson: "The facts are downright chilling. While people of color make up over 30 percent of our country's population, a study from Free Press last fall tells us that they own only 3.26 percent of all broadcast television stations. Unpack these numbers a little further and you'll find that African-Americans own only 1.3 percent of all stations. And it's sad to say, we're not making progress. There has been no improvement in the level of minority ownership since 1998, even as the total universe of stations has increased by 12 percent. Truth is that there has been a sharp drop in the total numbers of African-American stations since 1998--by 30 percent. This isn't just a problem. It's a national disgrace." This a far cry from the tone set by the previous FCC administration, which was headed by Chairman Michael Powell, son of Colin Powell. (The current Chairman is Kevin J. Martin.) Under Powell, the FCC voted in early June 2003 to relax federal media ownership rules, permitting large conglomerates to buy more broadcast stations nationally and consolidate control over more newspaper and station combinations locally. It was widely feared this move would push out black ownership. With Black media ownership currently down, it stands to reason we are now seeing the result of this mandate. But will the current approach from the FCC indicate things might be changing? According to urban culture expert Dr. Marc Lamont Hill, Assistant Professor of Urban Education at Temple University, this public realization by the FCC could open some doors. "The fact that Michael Copps was willing to appear at the Wall Street conference suggested that we would hear an appropriately critical perspective, as well as promising plans about the role of Blacks in media," he notes. But while Coops has acknowledged this imbalance, it will be up to African Americans to force the government to follow up. "Unfortunately, such comments don't necessarily certify that we have sufficient political will to fix the apparent problems," Hill points out. "In order to increase minority representation, both in front of the camera and in the boardroom, the Black community must continue to push its political representatives to push for legislation that forces the hand of media conglomerates." This will not merely be a matter of speaking up. Any calls for change, says Hill, will have to backed by an organized effort and economic power. "In the tradition of Rev. Jesse Jackson, we must fight this considerable battle on the grassroots level," he says. "And perhaps more importantly, we must direct our considerable economic resources only to those who have demonstrated a commitment to expanding opportunities to those who have been historically excluded." There are several ways to take advantage this critical moment. Black audiences need to make their voices heard, and demand not only more Black content but more Blacks in power positions and ownership. If not, a boycott of media advertisers could be called. Black business must join together and create an economic base in order to have the capital to own more media. Balanced media ownership will continue to be hard fought--but it is up to people to fight for diversity and an equal share of the media pie. 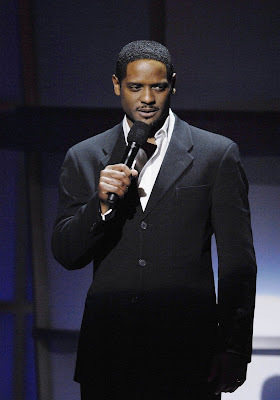 Blair Underwood holdin' down the stage at the BET's "Celebration of Gospel." 47: TRISTAN WILDS OF "THE WIRE"